Back when I put a roll bar in my 1991 BRG, Blackbird Fabworx pricing was different. Combine that with the fact that the plastic rear window was in great shape and I could use a NA type bar without the big full-width harness bar, and it was a logical choice for me. I'm now back in the market for a bar for my 1991 B package car, and having a more difficult time. See, my new car is going to have a glass window top, and there are two things about BBFW's NB bars that bother me... 1.) Price: almost $1400 delivered. 2.) The full-wrap harness bar that goes behind the seats. Hardtop & glass window compatible. Corner-to-corner single diagonal for weight, aesthetic, and visibility. 1.75" tubing (Mainly for aesthetic, partly for safety). Smooth, safe, seat belt retractors (if possible). I've reached out to Tom at Bethania Garage (Hard Dog Fabrication) and he has explained why their diagonals are at the angles they are... for safety. He also stated that a bar without diagonals would be an option for increased visibility... which is kind of conflicting. Trouble is, I really LIKE the single diagonal when it goes from corner to corner, like I had previously. But the M2HCHT is kind of the standard bar, and pricing is reasonable. Zerek Fabrication offers a single diagonal in 1.75" tubing, and claims the lightest bar on the market (not sure that's a good thing) with no mention of wall-thickness. Their seat belt mechanisms make me squeamish (aluminum with a slot, seems not-so-safe in more than one way). But the design of the bar appeals to me, and they also offer a really neat clear-coated raw option. Picture this minus the second diagonal and gussets. Anyone running a Zerek bar? I haven't reached out about shipping cost yet, but coming from CA, I assume it would split the difference in total cost between the HD M2 and the BBFW SD. I might also call Tom at Bethania back and ask that they go ahead and do a single diagonal, pointing to the fact that both of his competitors offer that design... he did say "they would work with me". Thoughts? Feedback on any of the designs mentioned above? ...then I re-read this, and think of all the other things I'm spending money on for this car. Sorry who the heck is Zerek, never heard of them? Is this the same company that took everyones money for a CF hardtop and then never delivered? The harness bar is bolt-in. 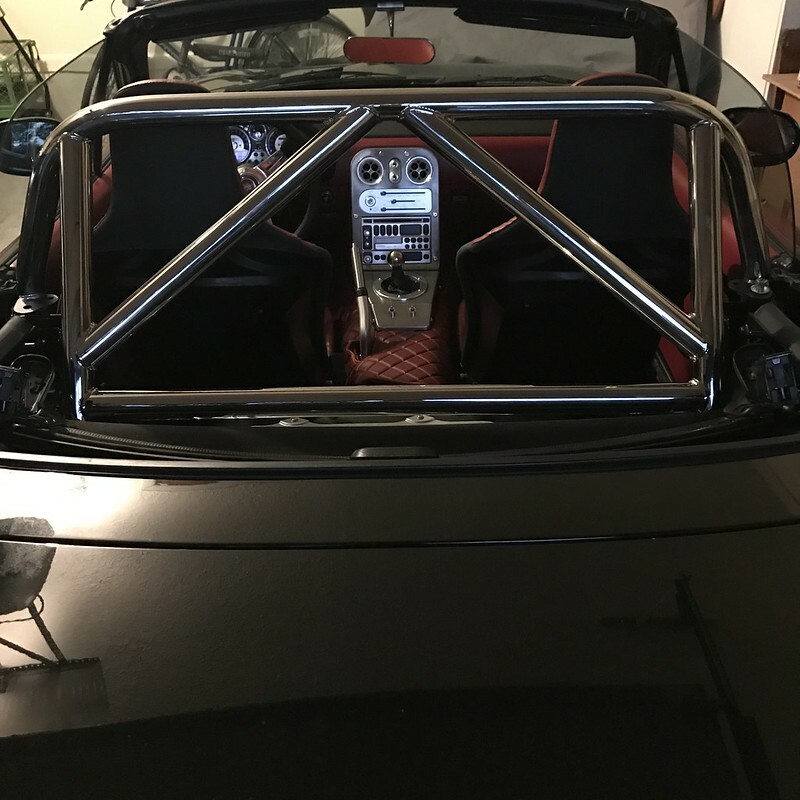 Why are you looking for a harness bar, anyways? Unless you're replacing the stock seats with an actual racing seat, harnesses are less safe. My vote is the Hard Dog. If you're looking for proven safety, go Bethania Garage. I don't plan on a harness, but I want to cover my bases for if I ever do get involved in anything that would require a race seat and harness setup. For now, the car will have stock seats. The harness bar is bolt-in. Why are you looking for a harness bar, anyways? Wrong. He's taking about the BBFW NB roll bar, which has an integrated harness bar. FWIW this gets my vote, and not only because I have one. Wrong. He's talking about the BBFW NB roll bar, which has an integrated harness bar. "This" being the BBFW NB SD? Pros: Aesthetic, rear visibility, weight, elegant seat belt solution. Cons: Price. Fugly welds. Slightly obtrusive/permanent harness bar. Price & shipping. Did I mention price? Who other than Bo says the welds are ugly? They look perfectly normal to me. I have really never heard of this arguments against their bars before -is this a common complaint? It's a huge price difference though, considering you're paying double just for aesthetics. I'm not gonna get into the "it's a safer bar" argument - any bar that is on NASA's approved list is safe enough. Moti knows what the hell he's doing though, and I don't doubt that his bars are a notch above the others available on the market. That said, the welds on my NA SD weren't pretty. Just look at pictures of various bars. Look at the ZerekFab bar above and compare. Now, I know there's likely an argument about weld penetration and ensuring everything is securely welded together rather than just tacked up... but I'm not a welder, so I can't argue that one either way. Yeah I don't know the first thing about welding either. All of these are going to be great choices. Zerek is priced a little better than BBFW, but I've heard mixed reviews. Not about the quality of the product, but about the business as a whole. I don't want to take a side in this argument, because I don't care enough to, but you might want to - if you care about originality. Roadster7: How tall are you? I just reviewed your build thread, some concerns about stock seat and BBFW NB bar confirmed. Also, you haven't installed a soft top since the bar, have you? If so, do you use a boot cover? I haven't had a soft top on this car in years, I don't use the boot cover.